We have witnessed a miracle! In the wake of a digital revolution and amidst a storm of commercial media, a little offline oasis still survives. 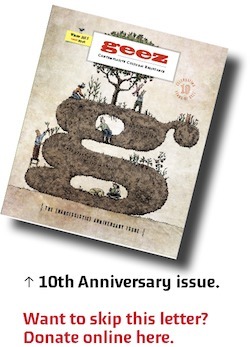 Geez magazine – your quarterly, ad-free, parcel of inspiration and enlightenment – is 10 years old this month. Watch for our special anniversary issue, number 40. In it we listed 253 volunteers with the project over the years. And the number of writers, artists, photographers, and illustrators is much larger. We have little money. Our subscription base is solid but too small to support paid workers, and we’re counting on donations to carry us to the end of the year and early next year. Normally we pay our team of part-time workers just over minimum wage ($12/hr, flat payscale). We have 5 people sharing the equivalent of 1.65 full-time positions. However, for the past year, to keep the magazine going, we agreed to cut our pay by 40% in the hopes of recovering ground. This is to say, we are struggling financially and feeling it personally. We are stretched with demands from other part-time jobs, and couldn’t do it without spousal support. Fortunately, we have a modest government grant to help with business development for 2016, and we have a tenacious spirit, fuelled by a passion for our editorial vision. But that’s not enough to pay the bills. Many of you are already “Geez Monthly Donors.” If that’s the case for you, please read this letter as a word of thanks for your ongoing support and only a gentle nudge to give more if you can. For others, if you wish to become a Geez monthly donor, please select the “monthly” option on our donate page or contact us at subscriptions[at]geezmagazine[dot]org. If you want to give a gift to a loved one, please see the gift subscription options online. I have sent this letter electronically to save on printing and mailing costs. It also allows you to easily donate online via credit card (see the options at geezmagazine.org/donate). Or, if you prefer to send a cheque by mail, please make it out to “Geez magazine” and send it to 400 Edmonton Street, Winnipeg, MB R3B 2M2.